Ladies, at some point or another, you’ve surely donned something Juicy Couture. It’s likely because the brand has something for everyone: from the terry cloth bags with cutesy plastic cherry charms that you loved in middle school to the luxe dresses that you’re drooling over for your fall wardrobe right now. But the most consistently sophisticated part of the brand has always been the substantial fragrance collection. 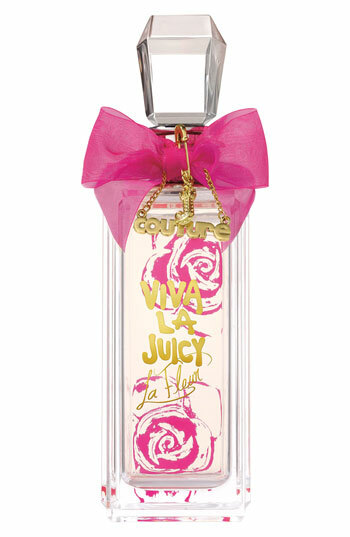 In celebration of their newest launch, Viva la Juicy – La Fleur, Juicy will be giving away 10 bottles to Twitter followers tomorrow, August 24. To learn all about the fragrance and Tweetstakes, read on! Tweet about your favorite flower using #LoveLaFleur. That’s it! Couldn’t be easier, right? Ten lucky winners will score a full size 5.0 oz. bottle of La Fleur. This giveaway will be active on Friday, Monday 24. Spread the words to your friends, and let us know if you’re one of the winners! Tweet @collaboreight too, to let us know you entered. We’ll be sure to keep you posted on the latest.